← KBIS is Dead. Long Live KBIS. Before I opened the WordPress Blog Insights-2-Ignite, I had posted a few blogs on a blog platform called Posterous. Now Posterous is closing so I’ve redeemed this blog from my archives (Jan. 2012) and re-posted it below. 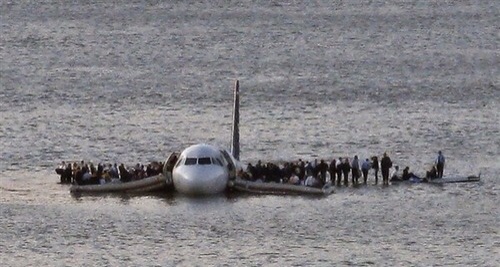 Three years ago on Jan. 15, 2009 US Airways Flight 1549 took off from New York’s LaGuardia airport with 155 passengers. Shortly after takeoff they struck a flock of geese, lost both engines, and made an emergency landing in the Hudson River. Not a single life was lost. Captain “Sully” Sullenberger who had over 20,000 hours of flight experience told CBS Evening News this, “One way of looking at this might be that, for 42 years, I’ve been making small regular deposits in this bank of experience: education and training. And on January 15, the balance was sufficient so that I could make a very large withdrawal”. Suppose you and your customers are aboard the airship _______ (insert your product/brand name here). Does your pilot (leader), have the familiarity, experience, and expertise with your brand to guide it through the hazards posed in the competitive environment of 2012? Or is he/she just sitting in the cockpit as part of a corporate career path for a couple years until the next move presents itself? How will you and your customers fare as passengers on this ship? 1. Is the aircraft (product) sound? Reliability, overall quality – fit and finish, etc.? Is it on the runway and ready to go – availability? 2. Are your passengers (customers) on board – ready, willing, and able to take the trip? Or is there a threat that they may choose another carrier (a competitor)? 3. Are you on board? Are you and your pilot (leader) in sync, and comfortable that the 2012 goals and expectations are realistic? Or are you set up to fail? It’s the pilots (leaders) responsibility to make sure that the checklist is completed, the fuel tanks are full, and that you are ready for a safe and productive journey in 2012. Your job is to deliver on a sound and sensible plan. This entry was posted in Business and tagged checklist, competitor, customers, leader, leadership, learning. Bookmark the permalink.